Anderson ZurMuehlen is pleased to announce that it has been selected for the Governor’s inaugural Equal Pay Task Force Award. This award is based on our firm, early on, taking a pledge to comply with Executive Order No. 12-2016. In essence, our firm pledged to be transparent in our compensation practices by posting salary ranges in employment listings; certifying that we will not ask about wage history in employee interviews; and certifying that the firm will not retaliate or discriminate against employees who discuss or disclose their wages in the workplace. 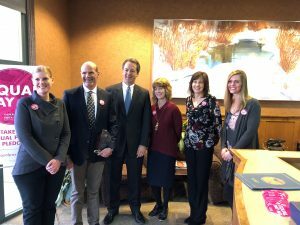 Governor Bullock recognized Anderson Zurmuehlen, for its work in developing workplace policies that support families. Anderson ZurMuehlen has implemented flexible scheduling, updated its maternity/paternity leave policy, and created a transparent process that allows staff to progress into shareholder roles. Sixty-three percent of Anderson Zurmuehlen’s shareholders are women. For more information about Governor Bullock’s Equal Pay for Equal Work Task Force, visit www.equalpay.mt.gov.